The most recognizable hallmark of classic film noir — the corruptible protagonist, driven by greed, lust, and ambition into a series of mistakes, each more damning than the last — is embodied in The Square. Ray Yale (David Roberts), plans to ditch his wife and run away with the lovely Carla (Claire van der Boom), also married. They’ve concocted a plan (foolproof, they imagine) to torch Carla’s home and make off with her husband’s hidden cash. They’ve even hired an arsonist — a mad dog named Billy (Joel Edgerton) — to do the job right. If that sounds like a recipe for disaster, you’ve got the idea. 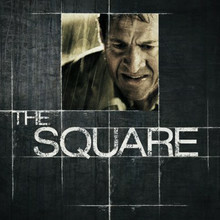 Professional stuntman Nash Edgerton, who makes his feature-length directorial debut with The Square, sets this gritty little drama in his native Australia, in the kind of town where disappearances rarely go unnoticed. Here, there are several, as Ray’s best efforts to conceal one accidental murder lead to many more. And yet his will remains unflappable, as if a single tactical maneuver, that elusive stroke of genius, can set his universe in order. It’s not to be. If Joel Edgerton’s script, co-written with Matthew Dabner, illustrates anything, it is his fascination with the principles of Murphy’s Law, and with a cinematic genre in which fallibility leads, with almost comical precision, to self-destruction. Ray is neither malicious nor a killer at heart. But he’s willing to tread in dangerous waters, and the tide drags him under. Brothers Nash and Joel Edgerton, whose latest collaboration is a taut portrait of desperation and the escalating terror it inspires, have been likened in many circles to a young Joel and Ethan Coen, whose own debut, the noir thriller Blood Simple (1984), has more than a little in common with The Square. Based on the evidence, the Edgertons are skillful filmmakers who appreciate the power of a lean, bruising narrative fraught with moral ambiguities and, in this case, too-obvious irony. Where they go from here remains to be seen, but I look forward to finding out.